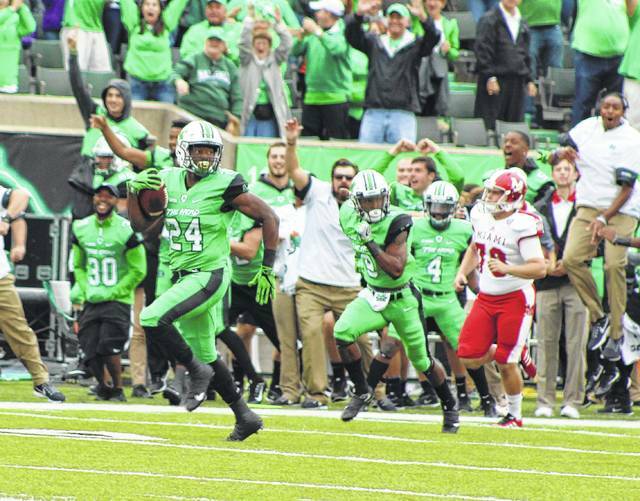 HUNTINGTON, W.Va. — Special teams ultimately made for a special opener. Keion Davis set a school record with two kickoff returns for touchdowns, first-time placekicker Kaare Vedvik was perfect on all five of his boots and Marshall held off visiting Miami (OH) for a thrilling 31-26 victory in the 2017 season opener for both programs Saturday night at Joan C. Edwards Stadium. The Thundering Herd (1-0) received a touchdown apiece from their offensive and defensive units, but 19 of the hosts’ 31 points came from Davis and Vedvik. It also didn’t take long for either of them to get to their stellar evenings started. Davis received the opening kickoff at the one, then went untouched for 99 yards along the Herd sideline for a quick score. Vedvik tacked on the extra point for a 7-0 Marshall lead just 12 seconds into regulation. The RedHawks (0-1) followed with a 15-play, 66-yard drive that resulted in points following a 27-yard field goal from Sam Sloman, making it a 7-3 contest with 8:34 remaining in the first. Both teams followed by trading possessions, but the Red and White picked up a Herd fumble late in the first and returned it to the Marshall three. It took Miami four plays and a change of quarters, but Gus Ragland plunged in from a yard out on 4th-and-goal to give Miami its only lead of the night at 10-7 with 13:57 remaining in the half. Marshall countered with its best offensive series of the evening after stringing together an 11-play, 98-yard drive that resulted in a 22-yard touchdown pass from Chase Litton to Tyre Brady. Vedvik tacked on the successful PAT for a 14-10 edge with 9:36 remaining. Miami answered with a 13-play drive that covered 50 yards and resulted in a Sloman 42-yard field goal, cutting the RedHawk deficit down to 14-13 with 3:15 left until halftime. On the ensuing kickoff, Davis fielded the ball at three and again went untouched for 97 yards — allowing Marshall to extend its halftime lead out to 21-13 with 3:02 remaining. The Herd appeared to have nailed the coffin shut on Miami’s second possession of the second half as Chris Jackson picked off a Ragland pass and returned it 72 yards to the house. Vedvik added his fourth and final extra-point kick while giving the hosts their largest lead at 28-13 with 5:30 left in the third. The guests, however, answered the bell by marching right back down the field as Ryan Smith hauled in an 11-yard pass from Ragland, capping a 9-play, 75-yard drive that made it a 28-20 contest at the 2:05 mark of the third stanza. Both teams traded punts before the start of the fourth, then Marshall put together a 7-play, 44-yard drive that resulted in a successful 27-yard field goal by Vedvik — putting the hosts back on top by a 31-20 lead with 11:31 left in regulation. The RedHawks countered with an 11-play, 84-yard drive that ended with a 19-yard TD pass from Ragland to Smith. The two-point run was stopped, but Miami had closed to within 31-26 with 8:01 remaining. Both teams traded punts away on the following three drives, allowing Miami one last shot with the ball at its own 17 with 53 seconds remaining. Smith hauled in two passes for 32 yards and the guests also benefited from two Herd penalties, moving the ball down to the Marshall 41 with five seconds left. Ragland took the snap, waited for his receivers to get down field and uncorked a Hail Mary pass toward the back of the end zone. The ball sailed well beyond the back line and into the arms of Miami receiver Sam Martin four yards out of bounds, allowing Marshall to hold on for the 31-26 triumph. Miami had 10 more first downs (25-15) and outgained the Herd by a sizable 429-267 edge in total offense, but the key to the final outcome came down to special teams — an area that Marshall head coach Doc Holliday thought his troops had an advantage in coming into the opener. The hosts claimed a 209-11 advantage in kickoff return yardage, due in large part to both Davis TD returns. Vedvik, however, booted five of his six kickoffs into the end zone for touchbacks and also had an average of 49 yards on four punts — half of which ended up inside the Miami 20. Davis became the first player in Marshall history — and the 20th different player in NCAA college football history — to score on two kickoff returns in the same game. It was also the third career kickoff return for a TD by Davis, all of which have been 97 yards or longer. Marshall has won seven straight home openers under Holliday, who is now 54-37 a game into his eighth season. 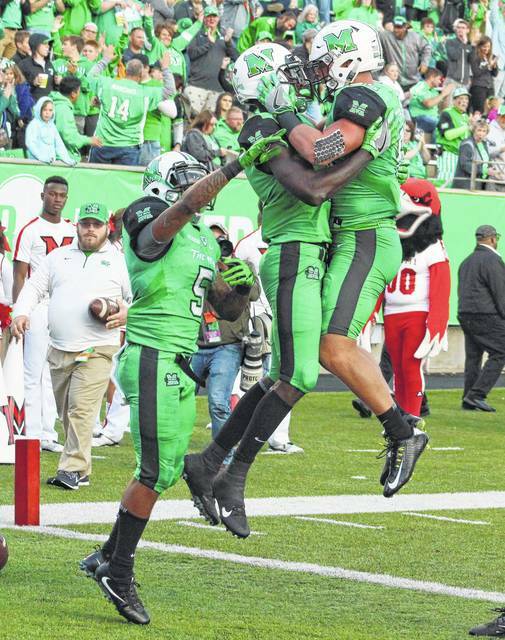 It also didn’t hurt that it was the Herd’s fourth straight victory over the RedHawks. Trey Rodriguez led the hosts with 54 rushing yards on 18 carries. Litton finished the night 20-of-30 passing for 208 yards, including one TD and one interception. Willie Johnson led the wideouts with seven grabs for 88 yards. Brandon Drayton led the Herd with 12 tackles, while Chase Hancock and Marquis Couch each recorded a sack and at least one tackle for loss. Jackson had a pick-six and Omari Cobb recovered a fumble and advanced it 12 yards. Alonzo Smith led Miami with 59 rushing yards on 13 carries. Ragland finished the game 23-of-44 for 298 yards, throwing one pick and two scores. James Gardner led the receivers with eight catches for 111 yards. Brad Koenig led the RedHawks with 13 total tackles, while Junior McMullen had their lone sack. Josh Allen came away with an interception and Heath Harding recovered a fumble and returned it 35 yards. Marshall — which ended 2016 with two straight losses — also ended Miami’s six-game regular season winning streak. The Herd travels to Raleigh on Saturday for their 2017 road opener against North Carolina State (0-1). Kickoff is scheduled for 6 p.m.
Marshall redshirt junior Keion Davis (24) looks back at the Miami (OH) defense during his first of two kickoff returns Saturday in a 31-26 season opening victory at Joan C. Edwards Stadium in Huntington, W.Va.
Marshall teammates Trey Rodriguez (5), Tyre Brady and Ryan Yurachek, right, celebrate after a 22-yard touchdown catch by Brady during the second quarter of Saturday night’s season-opening football game against Miami (OH) at Joan C. Edwards Stadium in Huntington, W.Va.